Thank heavens for Bloomberg.com! It lets you track your investments in Philippine stocks, mutual funds and Unit Investment Trust Funds (UITF). But before we get to the details on how you can do that, let’s discuss the idea of investment portfolio tracking for a bit. As investors, we are inclined to believe that the more frequent we monitor our portfolio’s performance the better it is for us. After all, knowledge is power right? Well, there are actually quite a few compelling reasons why tracking your investment portfolio on a daily basis is not a good habit to develop. Let’s discuss each of these reasons in more detail so that even as we have better tracking tools, we don’t overuse them to our detriment. If you’re going for volatile investment vehicles such as stocks, your time horizon should be long. This will lessen the risk of losing money over the high degree of stock price fluctuation in the market. Tracking the prices of your stocks on a daily basis won’t make sense because you already know that variations will indeed happen. There’s nothing to be gained over the long-term from knowing what the daily prices are. But the reason I’ve just given above will not convince a lot of people who just want to know. They’d justify that one look shouldn’t hurt. If you think about it, however, the level of our productivity is greatly impacted by the things we do unnecessarily. Looking over your portfolio's performance, for instance, may not take more than 5 minutes of your time but it takes away your focus from more important tasks. In this age of constant and unrelenting distraction brought about by information technology, our productivity is being compromised more and more. Checking out your stock position for 5 minutes a day may mean nothing much to you. But these distractions add up to diminish your overall productivity. Before you know it, your day has ended with nothing accomplished. Constantly knowing how good or bad your investment is doing can be a source of anxiety too which can be bad for your happiness. This is especially true when stock prices have dipped. Seeing how much money was lost (theoretically) can be distressing for most people. But these loses are not real unless the investor sell and thus make the loss a reality. It’s not something a long-term investor should spend too much time worrying about. Being aware of unrealized loses has the potential to unnecessarily ruin a perfectly good day. Still, we do have to occasionally look at how our investments are doing. It may be a few times a month or even less. Having a one-stop website to monitor all your investments is a pretty good tool to have. 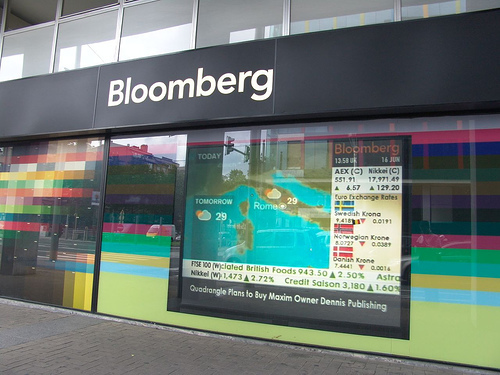 That is exactly what Bloomberg Watchlist can do for you for free. All you need is to create an account with Bloomberg.com which cost nothing as well. After you’ve signed up for an account, you can head on to the Watchlist section by following this link: http://www.bloomberg.com/markets/watchlist/. Yellow - you can create and name multiple Watchlists. 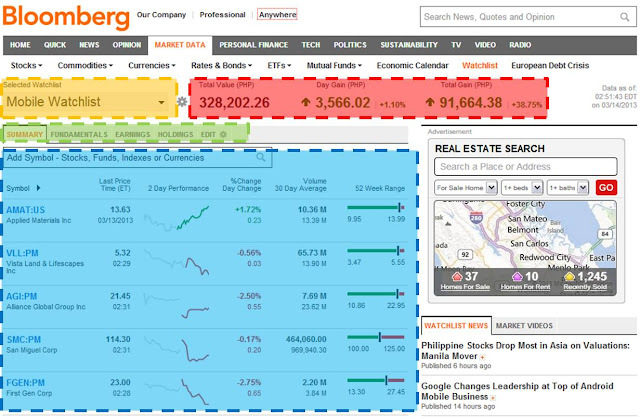 Shown here is “Mobile Watchlist” which will also be visible on any Bloomberg mobile app. Red - a summary of the particular Watchlist performance is shown. Green - these tabs are a way to navigate the details of every stock, mutual fund or UITF that you have. You can also choose to edit your data here to reflect any update to your portfolio. Blue - this region reflects the detailed information about your investment portfolio depending on which tab is chosen in the green field. This is just a short overview of what’s in store for you if you choose to monitor your investment portfolio using Bloomberg.com. I don’t intend to get into more detail than this. To really get a feel of how this works, you should try it to experience it yourself.